The fashion industry is confronting its own destructive behavior to the environment and it's been a long, painful process but I believe it's for the better. Every brand who seriously confronts its own impact needs to think about its entire supply chain. Perhaps it was having children, perhaps it was 9/11 - I don't know somehow, I started taking an intense interest in the intricate workings of the world. I decided I would not be satisfied floating in my fantastic theatrical bubble. I would use my artistic background to have an impact on the real economy. And fashion, well it's so humanly expressive, like the Shakespearean world is our stage! While managing the re-fashioNYC program, and later piloting the curbside collection of clothing, I was essentially working on everything that happens after fashion. I learned that clothing, accessories, and linens makeup 6% of New York City’s waste stream – that’s 200,000 tons thrown away every year! To put that in context, that’s 14 times the weight of the Brooklyn Bridge. At Applied DNA Sciences, we think of sustainability as being synonymous with versatility. Taking existing technologies and transforming them into ways that address a real need in the world. This can take the form of providing forensic scientific solutions to develop new applications to support sustainable claims, or to assure purity in the supply chain, or to ensure that conflict materials are not used in the manufacturing of a finished product. The versatility of our technology is one of the true gifts we offer to our partners and customers. As the Supply Chain Transparency Specialist at EILEEN FISHER, I research and analyze our supply chains to create a complete picture of how are our garments are made and to understand the impacts of production from fiber to factory. 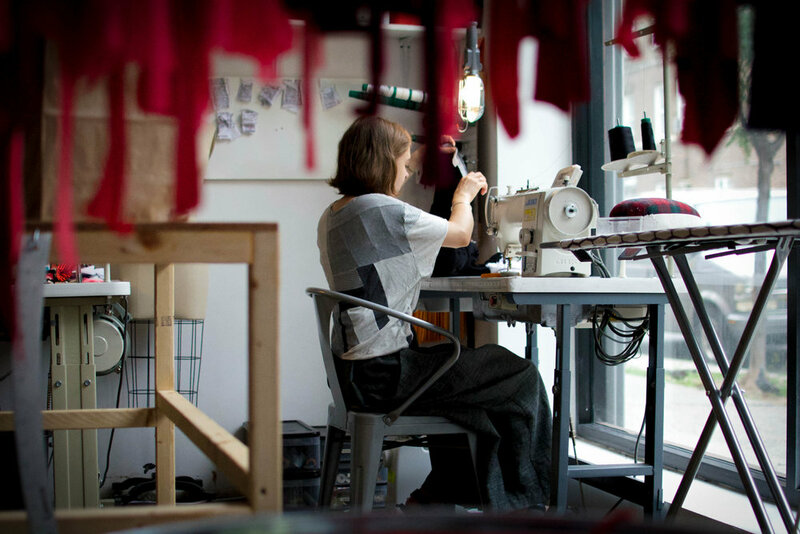 Supply Chains in the fashion industry are particularly complex and difficult to penetrate. They also happen to conceal extensive environmental and human rights abuses. On the other side of the coin, providing transparency into the fashion industry presents an exciting opportunity because of the cultural power of clothing. People feel connected to their clothes in a special way, which, in my option, will make the environmental impact of a transparent supply chain even more powerful. Meet Rebecca Van Bergen the founder of Nest, a nonprofit dedicated to alleviating poverty, empowering women and promoting peace through the successful creation of artisan businesses. We started from a deep understanding of the possibilities and constraints of Jacquard weaving, then set about to translate those into a form that would make sense for people without industry experience. We've developed some novel approaches that allow us to offer a wide range of options while maintaining an efficient manufacturing process. This allows us to offer small volumes of fabric at a reasonable price. Techpacker is the world’s first fashion life cycle management tool (PLM) that is designed for growing fashion designers and brands. Our philosophy is to build accessible and affordable design management solutions so that any designer can get quality products made from any part of the world easily. What inspired you to start Love is Mighty? I wanted to start a business that I believe in, one that was not fractured from the way I live my personal life, and one that found a confluence for all my passions – human and animal rights, the environment and healthy living. I had been working in fashion for close to two decades at the time and realized that it was time for a change. I took off to India for a few months in 2010. On this trip, I connected to artisans living in remote villages, off the beaten path. I had always been drawn to tribal embroideries and beadings as a child, and it saddened me to see the demise of some of these art forms due to rapid urbanization. A seed was planted. When and why did you start Study? In 2009, after working on Covet for 5 years, my design career was going in a very different direction from that of the company I worked for, so I decided to leave. Starting Study happened somewhat accidentally. I was a part of the sustainable design community in New York (because Covet was made using environmentally friendly materials) and I was invited to show at NYFW when the GreenShows started. I had no collection to show, so I started Study. That was my first collection, for the Spring of 2010. ELSA AND ME offers a signature dress – the ELSA dress which can go from work to a cocktail party. It fits and flatters for most off the rack and can be customized for all else. It is made to order and produced locally in New York with organic fabric.